Karbonn K9 Jumbo is a cheap phone that was launched in 2012 with Dual-sim mechanism. Regarding the memory, it support micro-SD card upto 16 GB and can save 1000 entries in phonebook. It also record calls. For photos and videos, it include 1.3MP Primary camera and also record video with a resolution of 480 pixels. The connectivity medium of the phone include Bluetooth, USB and Radio. It is powered by Li-Ion 1800 mAh battery to support its display of 2.4 inches with a resolution of 240×320 pixels. The type of display it consider is TFT, 256K colors. It comes in two colors which are Black and Red. 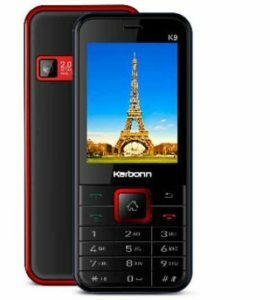 The price of Karbonn K9 Jumbo in India 1,080.